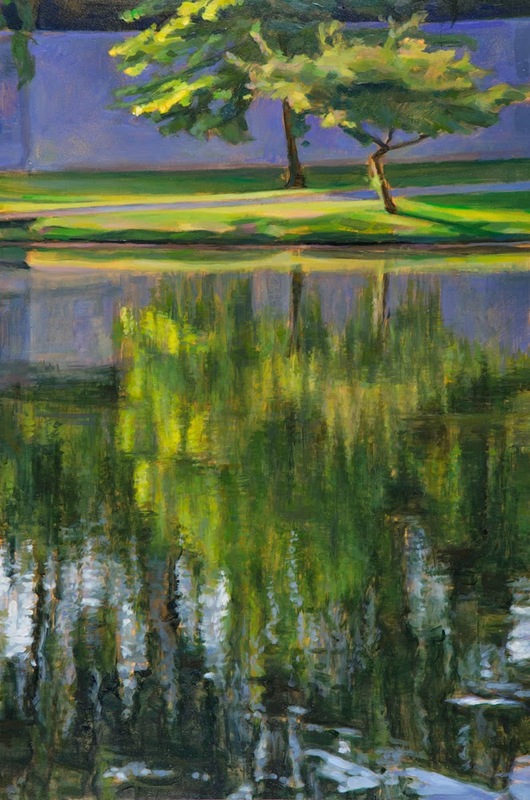 Massachusetts artist, Linda Pearlman Karlsberg is an award winning oil painter and co-owns and directs a photography studio, Studio Eleven with her husband. After completing her BFA and MFA at Boston University School for the Arts, Linda taught fine art for quite some time while also painting on her own and raising a family. Her luminous work has been featured across the country in numerous juried exhibitions, galleries and catalogues including The National Steinbeck Center Museum, Gertrude Herbert Institute of Art and Point Park University. Linda has always enjoyed the arts and has fond memories of lessons with her grade school art teacher. Her interest grew throughout school and she was able to take classes for high schoolers on Saturdays at the School of Museum of Fine Arts, Boston and Massachusetts College of Art. She made the full commitment to art in college and chose oil painting, being inspired by some of the masters she studied in art history-- Vermeer, Caravaggio, Rembrandt, Sargent, Eakins and Vuillard to name a few. "I wanted to try to achieve some mastery. I think with every painting I paint, I still work to find ways to apply the oil paints, so that the marks, the texture and the colors please me. I think it is a challenge for a lifetime, to use the paint, to refine and develop my mark making, brush strokes and application. I am still reaching for those aesthetic goals that those artists achieved and I see in their work," Linda explains. 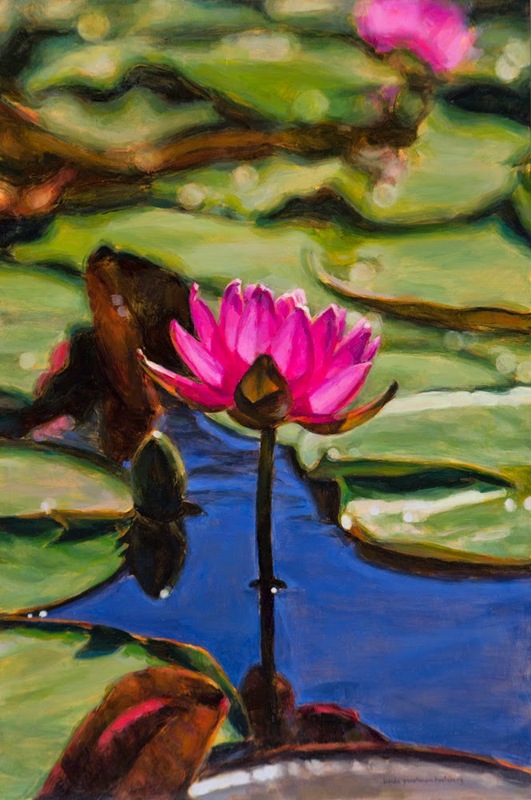 As oils and panels are her choices for her landscapes, still lifes and water lilies, Linda also believes in the choice of a great brush as an extension of her hands. "Really excellent materials are the tools artists rely on, and they can either enable and enhance the process or in their absence, handicap one's process. So brushes that hold their form, keep their spring, and don't fray too quickly are so important. They allow me to be in control of the mark making, quality and character of the surface and build up of the paint," she says. 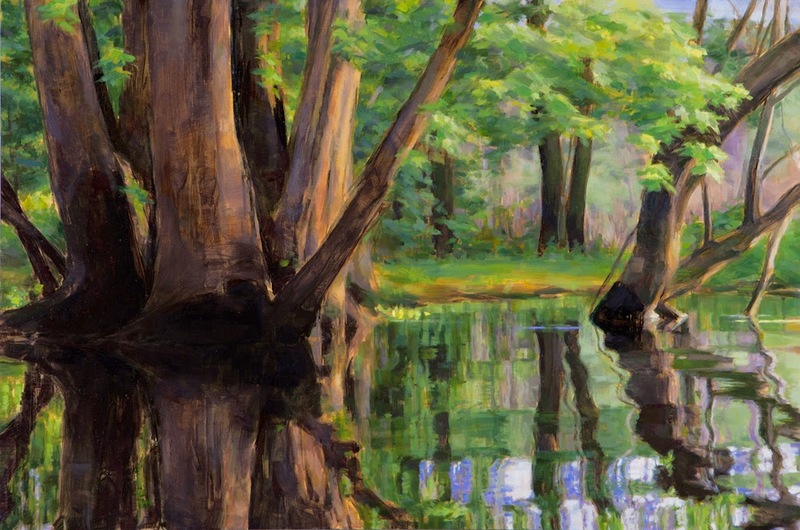 Linda uses a variety of brushes in her work, ranging from 0-10 in size, angles, flats, filbert brushes to rounds. "They each offer their own different strength and signature trail or way of applying the paint." Linda's beautiful strokes and masterful work encompasses different series, most often the visuals around her that elicit a visceral response. Linda paints the narrative and the quality of light that captures her subject, drawing her viewer into her story. She explains further, "I search for those times and places where beauty is startling and suddenly present. 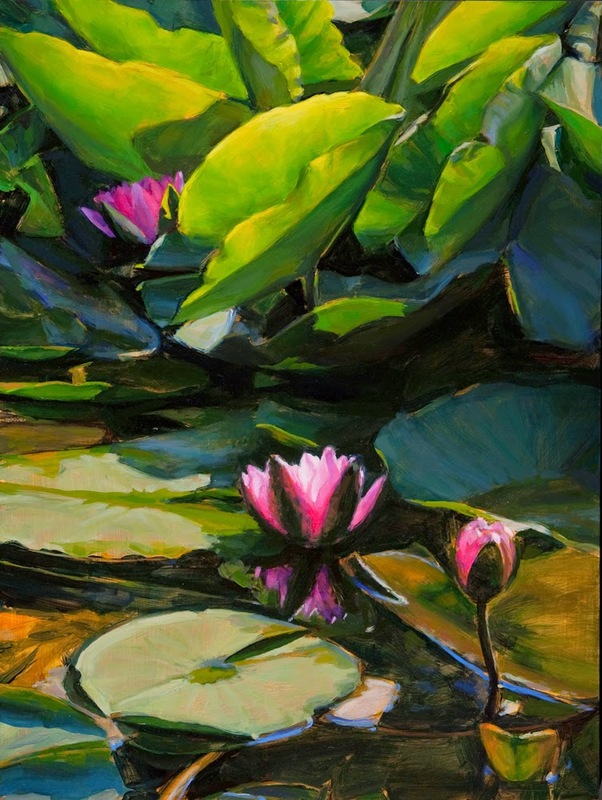 In the Landscapes, Water Lily, Lotus and Cloud series, I paint arresting color relationships that flare and bring a momentary expressiveness to these tranquil corners. While celebrating these transient visions, I think these scenes also evoke life's fragility which is inherent in this perpetual reshaping and reordering, this cycle of abundance and loss." So far you've had a glimpse at their opening last year from NAMTA and a glimpse at the artist, Andres Hurtado, using the brushes, but I have shared little about the full line and how they work. As you can see, there are several types of hairs and tuft shapes in the line. The bristle set has three sizes of floaters, soft rounded shape tufts; and three sizes of joiners, or full bodied flats much like scenic fitches; and then also three sizes of edgers, or angle brushes. The synthetic brushes consist of three sizes of rounds and six specialty shapes, a blend of synthetic hair meant for durability. The Urban FX line was created for muralists, either indoor or outdoor, or for speciality painting in large format. Jill Fitzhenry demonstrates the line on stone painting here, and Andre Hurtado demonstrates an indoor mural using the full line here. Urban FX can also be used for scenic artists, oil painters or anyone needing to work with heavy bodied paints. 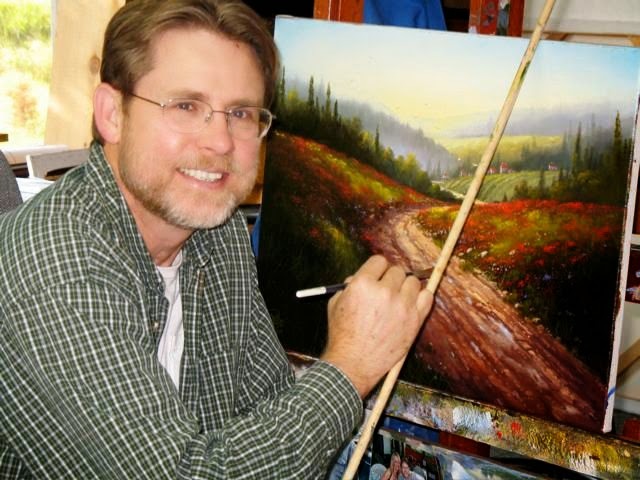 Oklahoma artist, Jerry Yarnell is always teaching painting. In fact, his career started with teaching, 60-70 students a week in workshops, at the age of 21. He noticed early on that he didn't have enough time for his own painting work, so he stepped away and moved to an artist- in-residency program in Taos, New Mexico to pursue his own work. But life and family called him back to teaching and Oklahoma. There he was discovered to start work painting for his first TV show. Now, decades later, Jerry is still teaching on TV, as well as online, at his home studio, across the country in workshops, and selling DVDs and books. Not to mention, he still finds his own time to paint and work in ministry. Jerry was always fascinated by art, honing in on his early teacher's abilities. His grade school art teacher, Harry Lively, sculpted in the classroom as the students worked, and Jerry stayed after school to watch him as much as he could. "I knew I liked the hands-on, being close to my subject and the feel of the texture, which was my first experience with a real artist," he shares.Semi-Realism is Jerry's style, which is an impressionist way of painting, pointing the viewer to the center of the piece. His subjects are most often wildlife and landscape. He explains that his style is conducive to his personality; his passion is to share his life and his work from his travels and experience. His teaching is yet another way for him to share, " I love to see the expression on someone’s face, a young person, an old person, when they accomplish something. And, I truly love to see people accomplish something, to be successful. " Jerry is more than a master of his style, he is also a master of the materials he uses. Throughout his career, Jerry spent time looking for the perfect brush. "Always searching for a brush with superior quality, craftsmanship that holds the brush shape through the test of all kinds of blending. Dynasty brushes are a main stay of my painting career; my students and I have chosen the Dynasty brand brushes after relentless experimentation and searching for the perfect brush," he explains. "If you use a low quality, coarse bristle, loosely put together brush, you get a scratchy look when you paint and not a good blend. Having good materials affects your work, if you are going to blend then you use a good sable or good bristle with fine hair. I prefer using brushes that fit the need. Sables are good for blending; synthetics are phenomenal for what we do because they are well put together, well balanced the hairs are evenly distributed and when they get wet they make a perfect slice of chisel. The set I use and recommend to my students is the #2, #4, #6, and #10 Flat Black Gold." You can purchase the exact sets of brushes that Jerry recommends from his online store and see the other essential art materials he uses for his workshops and glowing paintings. 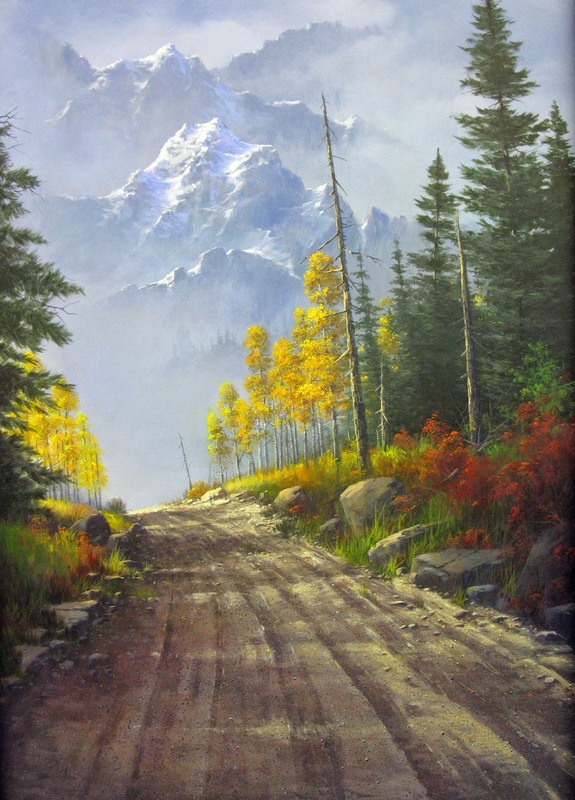 To see a preview of what you can receive from Jerry's online school, check out these videos, including his introduction on brushes: www.yarnellschool.com/topics or look around his YouTube channel for more inspiration. You can also find a full list of events and workshops on Jerry's official website: Workshop-schedule.